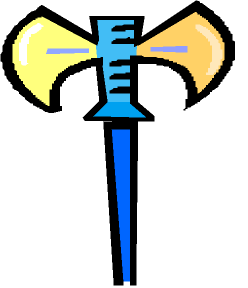 If you do a web search on "power booster amplifier," most of the search results will refer to radio transmitters, not audio amplifiers. This makes sense, as few of us would consider cascading power amplifiers. If we need a more powerful amplifier, we buy a more powerful amplifier. Still, the idea is an intriguing one: take a small, flea-power, single-ended, tube amplifier and a huge, heavy, solid-state, power-booster amplifier that greatly magnifies the wimpy 2.5W into hundreds of watts. The best of both technologies. Yes, I know that the solid-state amplifier is in series with the small tube amplifier and that the tube amplifier will only drive the solid-state amplifier, not the loudspeakers. And I acknowledge that this scheme stinks of the notion that tubes make nice distortion, which I most wholeheartedly reject. 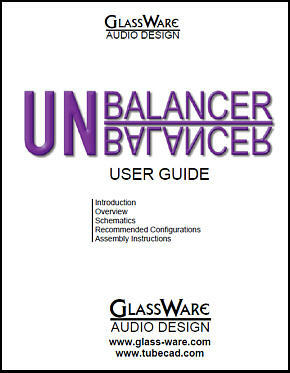 So why bother with this approach to better sound? First, few will be surprised by my pronouncing my fundamental intellectual interest over any practical application; this is the Tube CAD Journal, not Practical-Tube-Hi-Fi.com, after all. I like tackling heavy ideas the same way a weight lifter enjoys lifting steel weights. For example, the question, How long could a man survive in a vacuum? I find quite intriguing, although I have no interest in discovering the answer firsthand. So too, I wonder what such a power-booster amplifier would look like and whether it would function radically differently from a standard solid-state power amplifier and if the beefy power-booster amplifier need be exclusively a solid-state affair or can tubes be used instead. "The new Musical Fidelity 550K Power Amplifier increases the power of any 50 watt plus amplifier to over 550 watts rms. Most hi-fi amplifiers do not have nearly enough power to deliver musical realism. Until now the music lover either had to put up with inaccurate musical reproduction or fork out huge amounts of money for a physically massive amplifier to get that concert hall magic in their living room. The new Musical Fidelity 550K Power Amplifier is a conceptual breakthrough and has never been done before in hi-fi. The 550K Power Amplifier is installed between the existing amplifier and loudspeakers. Nothing else has to be changed or touched. It increases the power of the existing amplifier from 50 watts to more than 550 watts which gives any existing system sufficient power to give realistic concert hall dynamics in the home. The 550K Power Amplifier gives a new lease of life to existing hi-fi systems and allows the music lover to rediscover the passion and joy of music. Installing the 550K Power Amplifier is a doddle. It fits between the existing amplifier and the loudspeakers. 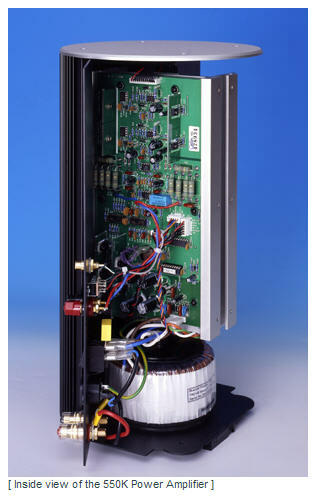 After it has been connected to the mains nothing else needs to be done as the 550K Power Amplifier has a sophisticated turn on/turn off music sensing circuit. The audible effect of using the Power Amplifier is dramatic and has to be heard to be believed. 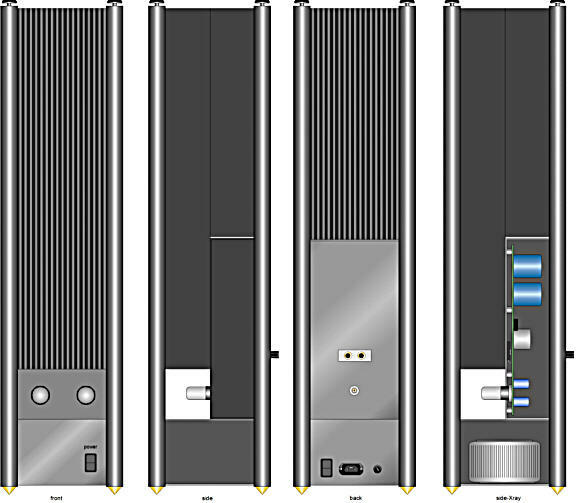 The 550K Power Amplifier is housed in a modern sleek package with a small footprint and can easily be positioned next to or behind the existing loudspeaker." Interesting. My favorite bit is the use of the word “doddle,” which as everyone knows is: Noun (Brit, Austral & NZ informal) something easily accomplished: the test turned out to be a doddle [Origin Unknown]. This handsome 550K power-booster amplifier reminds me of my long-held desire to build a power amplifier qua loudspeaker stand. I know very little about the MF 550K’s circuitry and the best description of its functioning I found in the following PDF link. The 550K’s input impedance is a low 50 ohms (low for a power amplifier, but high for a loudspeaker replacement). It uses a differential output stage to maximize the output voltage swing. It offers a voltage step up of about 3.16 (the square root of 10). And its output impedance is extremely low. The 550K also offers a line-level, high-impedance input, for those who just need a powerful amplifier. The first question that comes to mind is, Why a 50-ohm load? I believe this is a nod to all us tube fanciers, as a transformer-coupled amplifier requires a somewhat low load impedance, as inductive coupling is the exact opposite of capacitive coupling. For example, the lower the load resistance, the less inductance needed; the higher the load impedance, the less the capacitance needed. In other words, if the 550K had presented only a 47K input impedance, tube power amplifiers (the transformer-coupled type) would experience gross bass attenuation. On the other hand, the 50-ohm load impedance is high enough to keep both solid-state and tube amplifier operating over a wider class-A range, because of the less steep loadline. A compromise, in other words. The next question is Why a gain of about 3.16? 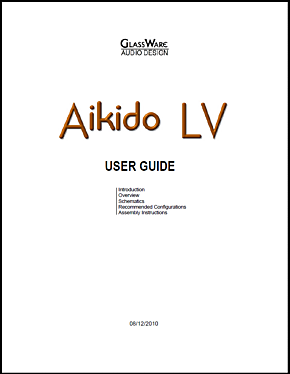 The 550k aims to increase the input amplifier’s output by tenfold, which means that the both the output voltage and current must be increased by the square root of 10, i.e. 3.1627. For example, 50W into 8 ohms requires 28.28Vpk and 500W into 8 ohms requires 89.44Vpk, which is 3.16 times greater than 28.28V. This amount of voltage gain also sets the required input voltage to realize the full 500W of output power, about 28V. In other words, if you use a tiny 2.5W single-ended amplifier, the 550K will only put out 25W of power, although it is capable of twenty times more output power. Returning to my original three questions: What would such a power-booster amplifier look like? 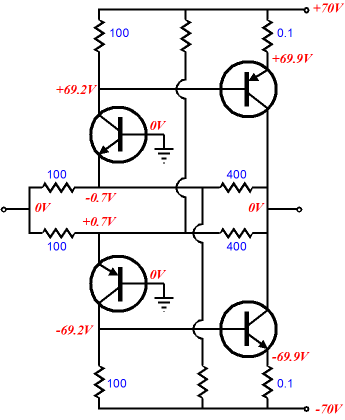 Can it function in a radically different fashion from a standard solid-state power amplifier? And, must the beefy power-booster amplifier be exclusively a solid-state affair or can tubes be used instead? Let’s start with the first question. Almost all solid-state power amplifiers consist of three stages, an input stage, a driver (VAS) stage, and an output stage. Would a power-booster amplifier need an input stage, as the existing power amplifier will already provide a good bit of gain? And what about the driver stage? 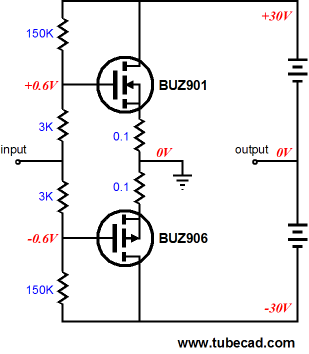 Cannot the existing small power amplifier drive the power-booster amplifier’s output stage directly? What if we use some of the output device’s transconductance to provide a bit of voltage gain at the expense of losing some of the low output impedance? A wonderful trick, but how do we pull it off? 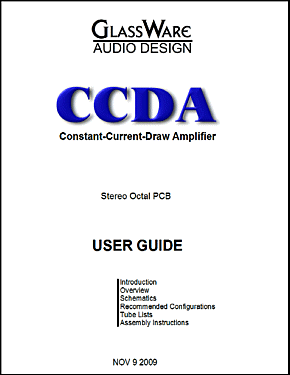 Long-time readers of the Tube CAD Journal will remember my early blog posts on simple power amplifiers. 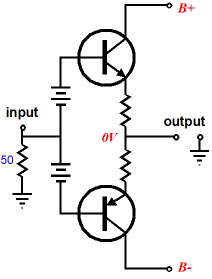 In the simple-PP-amplifier post, I outlined the following simple power amplifier topology with just two output devices and voltage gain. The 150k and 3k resistors define two feedback loops, with a summed voltage gain of 50 and an input impedance of about 1,500 ohms. (Here is an example where worse MOSFETs might work better, as an increased gate-bias [say 5V] would greatly reduce the voltage gain and, thus, greatly increase the negative feedback.) The output sits in between the two 30V batteries, where we usually find a ground connection. Instead, we find the ground connection in between the two output devices, where we usually find the output. This amplifier is inverted in topology and it also inverts the input signal’s polarity, which allows us to use the inverting-amplifier feedback loops. The batteries are no doubt confusing to many, but they serve to show how the power supply must be free to follow the output signal. 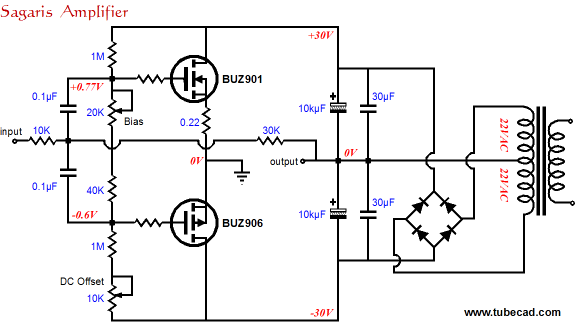 In an actual amplifier, the following setup is more likely. 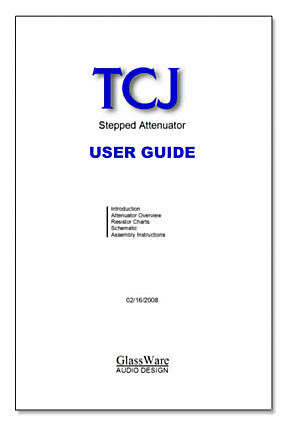 In other words, each channel must have its own power transformer winding and rectifier circuit. How do we get the voltage gain down to a more useable amount? 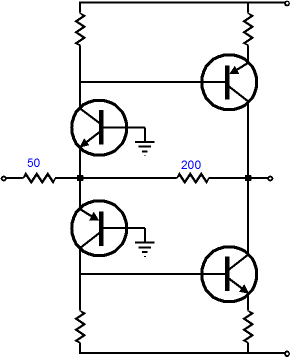 The following circuit shows how a third feedback loop can be applied. 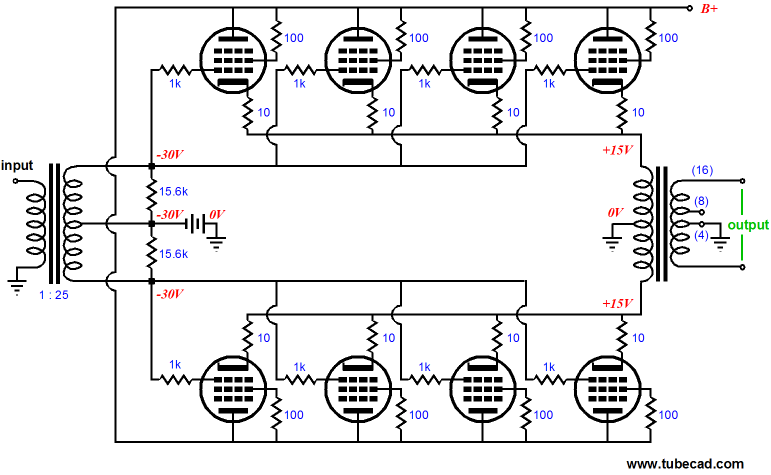 The Sagaris Amplifier uses two DC feedback loops to keep the output centered at 0V and an AC feedback loop to reduce the gain and lower the output impedance and distortion. Of course, different output devices could be used or several output devices could be placed in parallel. 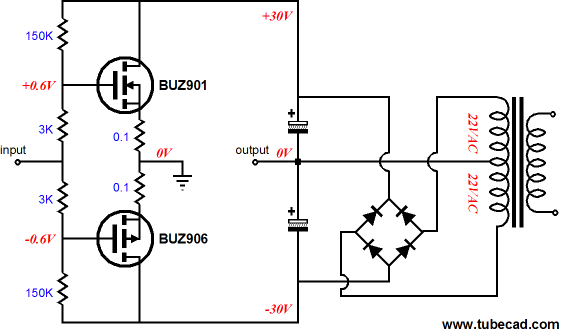 The two potentiometers help with amplifier housekeeping, such as setting the idle current and the output offset voltage. 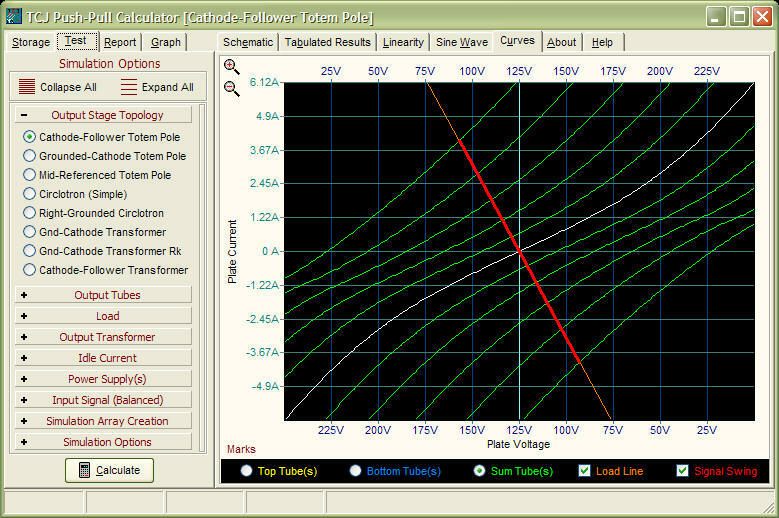 With the present devices and rail voltages, about 50W of output into 8 ohms is possible. Here is an alternative topology, which uses two stages. As configured, such an amplifier could not work in reality, as the input stage transistors are not correctly biased, but adding two resistors and separating the feedback loop into two parallel feedback loops does make something closer to usable. Actually, the more I look at the schematic, the more I would prefer to use MOSFETs as output devices. 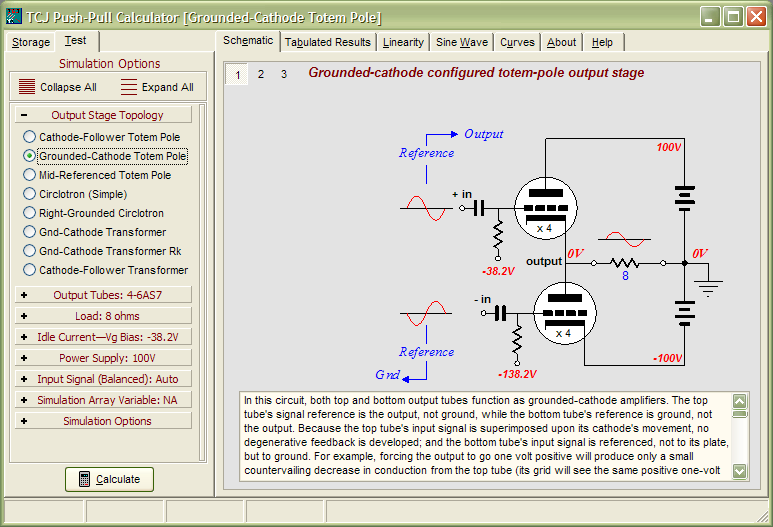 The grounded-base amplifier will not provide any voltage gain at its collector with the present resistor values, but with a larger collector resistor, it could. I could go on with many other possible solid-state power-booster amplifier designs, but what I want to end with is an all-tube power-booster amplifier. Super high-wattage tube power amplifiers can be built. We just need many output tubes and a high B+ voltage. But a conventional tube power amplifier is hardly novel nor would such an amplifier take advantage of the smaller power amplifier’s ability to drive a low impedance. 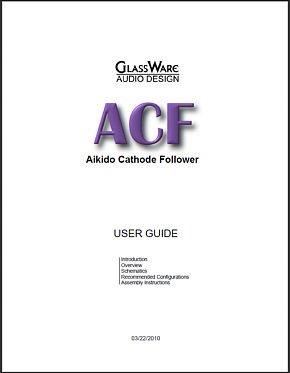 The above amplifier uses a 5k/10-20W output transformer to act as a phase splitter and to provide a huge voltage gain. 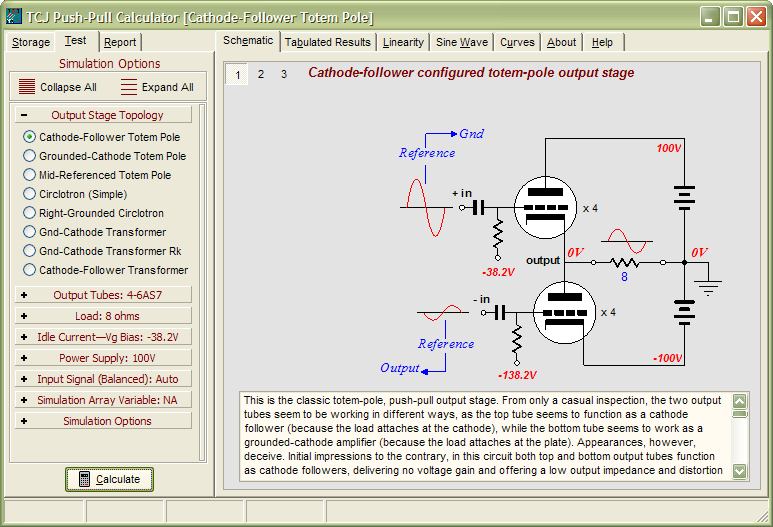 We need all the voltage gain we can squeeze out, as the output stage is configured as a push-pull cathode follower. 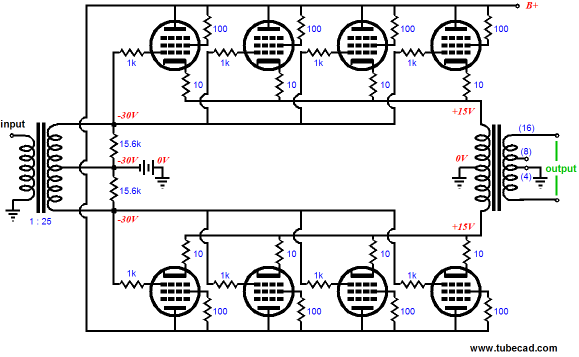 The eight output tubes use both cathode- and grid-bias to set the idle current. 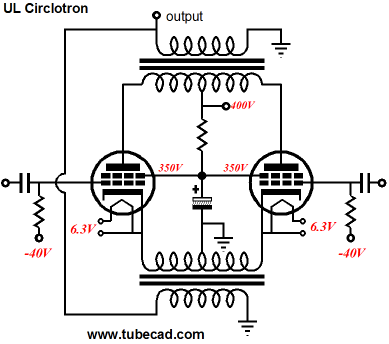 The two 15.6k resistors are reflected to the primary as 50-ohm load, as the transformer's winding ratio was 1:25, which implies an impedance ratio of 625 (625 x 8 = 5,000). 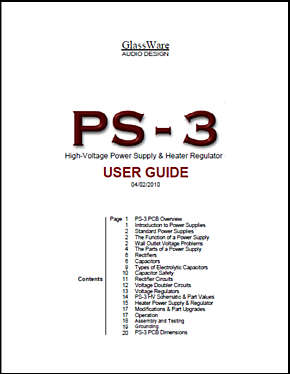 If EL34s or KT88/6550s are used, a B+ of about 400V to 500V will be needed. On the other hand, if a low-voltage/high-current sweep tube, such as the EL509 or 6LF7, is used, the B+ voltage can be lowered to a mere +170V (6AS7s are another good choice). I am tempted to stop right here, as what follows could be lethally dangerous. Since this power-booster amplifier uses an input and output transformer, the active circuitry is nested in between, making no DC contact with either the input or output. 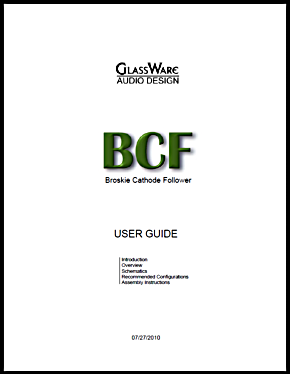 In other words, this power-booster amplifier might be a perfect candidate for using the otherwise dangerous rectified wall voltage trick, wherein no power transformer is used; instead, the raw wall voltage is rectified and used as the B+ voltage. 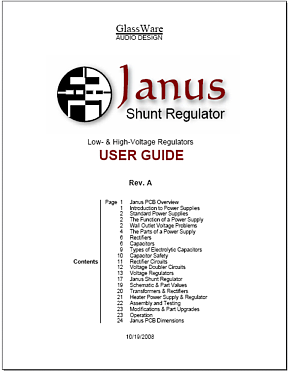 What makes using the wall voltage directly instead of a power transformer dangerous is the danger of the input or output transformers developing a short between windings. Fuses help, but I would still be nervous, particularly if a toroidal transformer were used, as the primary and secondary are in intimate contact. On the other hand, transformers that use separate wire bobbins, such as many C-core and R-core transformer do, would prove much safer. One last point to be made is that the output transformer uses the entire secondary to drive the loudspeaker; we need to use a low-winding-ratio output transformer, because of the low impedance presented by the many parallel output tubes. In addition, the output tubes could be wired as pentodes or triodes or even in an ultra-linear arrangement, as I described in blog 139. I have a few new PCBs to describe, but they will have wait until next time. In the meantime, more power to the loudspeakers, right on!